Avarakkai Poriyal - Broad Beans Stir Fry, this is one of the simple and easy recipe to make. No special ingredients are required for preparing this poriyal. This one will be a good option for busy morning cooking for packing lunch. Pack as a side dish for any rice you make. This is one of the basic poriyal recipe, most of you might be knowing it already. But, as I usually say the preparation of any dish will vary from person to person. Even I make Avarakkai in 3 to 4 different ways, this is one among that. I will post the rest of the methods soon. 1. Keep all the ingredients ready for making Avarakkai Poriyal. a. Wash the avarakkai and remove both the ends and veins from both sides of the avarakkai. Chop the avarakkai after removing the veins. b. Roughly chop the onion and dry red chilies. 2. Heat oil in a pan and add mustard seeds and urad dal. When the mustard seeds splutter, add the onion, dry red chili and curry leaves. Saute till the onion turn transparent. 3. Add the chopped avarakkai and saute for about 3 to 4 minutes. 4. Add turmeric powder and salt. Mix it well. Sprinkle some water and cook covered. 5. 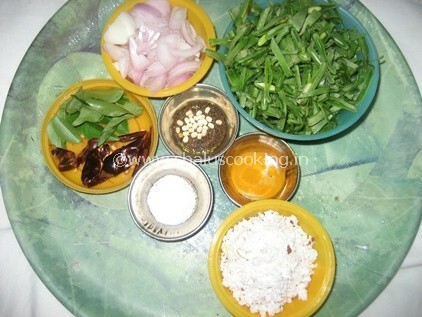 Once the avarakkai is cooked, add the grated coconut and mix it well. Simple and easy Avarakkai Poriyal is ready to serve. Serve as an accompaniment with any Rice Varieties.